Posted this photo in my Instagram few months back and most of my friends thought that we went to have pre-wedding photoshoot. In fact we just checked into Eastern & Oriental Hotel for a short staycation to celebrate BenDan's birthday; I thought to celebrate his birthday in a different way which is flee from the hustle bustle city (even though Eastern & Oriental Hotel located at the most happening area). We were longing to visit two hotels but ended up I pick this hotel than Hard Rock Hotel as they provide extra complimentary services which I'm going to talk about later. Between Heritage Wings and Victory Annexe (new wing), I chose the latter where we can have sea view from the suite's balcony. The receptionists at the front desk are very friendly and helpful, we were invited to have a seat at lobby while they were helping on the check-in process. Welcome drink and wet towel are served while we waited for the room key. We were then told that they have upgraded us to their Heritage Wings' Premier Suites, which means bigger room for us but we need to wave goodbye to our sea view. Was not really happy about that but the receptionist mentioned that we are still able to enjoy the complimentary services that applicable for Victory Annexe's guests only, we accepted this although the distance from Heritage Wings to Victory Annexe took us around 2 minutes in walking. Afterall, we should feel grateful whenever we get upgraded service. The best part about the Premier Suite is it has separate living room, bedroom and luxurious bathroom. 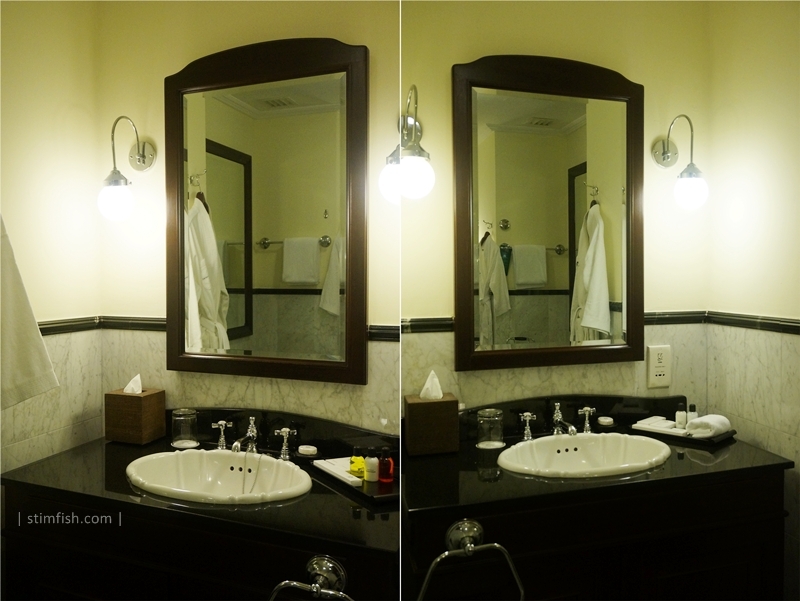 I just love everything in the bathroom, only the huge bathtub is enough for us to rejuvenate ourselves; the double vanity counters is the plus point, one for him and one for me depending on type of the toiletries provided at each vanity counter. I've been struggling to crawl out of the bed every time I lay on it as the bed is too comfortable to be true, different sizes of pillow are provided for your need. Everything that you can think of or you need is in the room; I brought my own hair dryer but I didn't even open it as it is provided in the room as well, and the hair dryer model is same as mine! A thoughtful move as the good hair dryer is a must-have-item for most of the girls. Two flat screen TVs are available in bedroom and living room; they even have double wardrobes next to the TVs in the bedroom. Mineral water and tea bags are complimentary but the CBTL coffee capsules are chargeable. Complimentary water limo service for 2 person from hotel to Straits Quay are included whenever you stay in Eastern & Oriental Hotel, reservation need to be made at Bombay Shop located at Heritage Wing and the seats are subjected to availability. Since we only stay for one night, plus the schedule of the water limo is not really cater for our time so we left this behind and continue to go around the hotel. Both Heritage Wing and Victory Annexe has their own Fitness Centre and swimming pool. We went to the Infinity Swimming Pool that located at Victory Annexe, it is with privacy assured as only hotel guests for Victory Annexe have exclusive access to the pool (even we were upgraded to Premier Suite at Heritage Wing, we were still able to access to the infinity pool). We were happily dipping inside the infinity pool, chilling by the pool and overlook the extensive view of Andaman Sea, it is simply spectacular and relaxing. Evening cocktail hours is inclusive for Victory Annexe hotel guests only from 5pm - 7pm in the Planters Lounge, all of these are encompass in the room rate. Both al-fresco and indoor seating are available in Planters Lounge; a good selection of drinks (alcohol and non-alcohol) and snacks (mainly tapas or canapes) are served in buffet style. We had our seats indoor as it was a warm evening, after munched on quite a bit of the snacks, we decided to walk around and chill by the pool side to enjoy the breeze. We didn't went out of hotel to hunt for dinner and decided to have BenDan's birthday dinner in the Sarkies instead, we were really fully immersed ourselves in the luxury hotel. Since we had some wines during the evening cocktails hour, so we opt for normal weekend buffet dinner; it was my first time to dine in Sarkies and I'm quite satisfied with the quality of food that provided by them. I didn't request Eastern & Oriental Hotel staff to have a birthday cake or celebration for BenDan, but we did saw other diners celebrate his/her birthday that night with birthday song played, as for my man he felt relief that I didn't did this to him. Laugh. The dinner is not a complimentary by the hotel, we paid for the dinner which we feel it worth the money. After a restful night, we woke up early in the morning to have the complimentary breakfast with the choice of buffet breakfast at Sarkies or continental breakfast at Planters Lounge (only for Victory Annexe hotel guests), we chose the latter as we had our dinner at Sarkies the day before. The food selection at Planters Lounge might not as extensive as Sarkies but I prefer the environment there as it is less crowded there. We were the first few to reach the Planters Lounge and we were welcome to place an order with any of the staff there if you need their services. So we ordered both scrambled egg and poached egg yet the poached egg was too salty to our liking. Other than that, we had the usual continental breakfast which I quite like it especially the grilled mushroom and smoked salmon. What a fruitful breakfast we had there! Before leaving the hotel, we had our last chilling session at the infinity pool and we really enjoy our one night staycation there; we thought to have a next visit there in future. Glad that BenDan is enjoying his stay and bear with me to take photos around like a paparazzi despite of fulling concentrate to celebrate his birthday. I'll opt for Victory Annexe again on the next stay, hopefully didn't get upgraded again so that we can have a extensive sea view straight from the balcony itself. To make a reservation in Eastern & Oriental Hotel, kindly visit their webpage here. Till then.